This really is an invaluable and versatile piece of equipment, a must have for every beekeeper. It will get used more often than a honey extractor for many different jobs throughout the year. Gently separate and extract honey from wild honeycomb and cappings. Gently liquefy set honey in containers as large as a 30lb bucket ready for bottling. Clarify bottled honey to delay granulation in the jar. Safely extract and purify beeswax from cappings or old comb. Pasteurise home bottled fruit, juice and vegetables. Use as a brew kettle for making mead or beer. It can also be used for many other cooking methods. 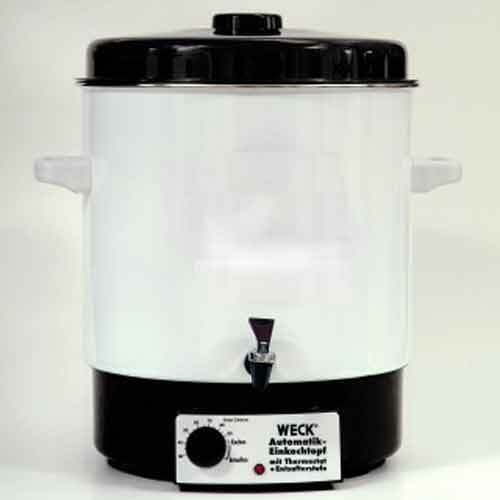 The 28 litre capacity, 35cm diameter tank is acid proof enamelled and fitted with a drainage tap. A separate grill insert is also included to maintain water circulation around containers. The 1800W heating element is concealed in the base so there is no contact between the element and the contents of the tank. The temperature can be accurately controlled between 30°C - 100°C on the thermostat dial. The Honey Warmer & Beeswax Melter really is an invaluable and versatile piece of equipment, a must have for every beekeeper. The 1800W heating element is concealed in the base so there is no contact between the element and the contents of the tank. The temperature can be accurately controlled between 30°C - 100°C on the thermostat dial. A separate grill base is included to maintain water circulation around containers. The 28 litre capacity, 35cm diameter tank is acid proof enamelled and fitted with a drainage tap. Warning: Honey should never be directly heated because it can quickly start to burn and spoil at high temperatures. That is the value of this machine - honey in containers (from little jars to 30lb buckets) can be gently warmed from every direction by the indirect heat of the surrounding water. Separate and extract honey and beeswax from honey crystallised in the comb or from wild honeycomb. Honey that has crystallised in containers can be melted in the same way as 2-5 above. Warning: Beeswax should never be directly heated because it can vaporise and combust at high temperatures. That is the value of this machine - beeswax can be safely melted in water at a controlled temperature. We hope that our advice is useful but this cannot be a definitive instructional guide - users are responsible for their own health and safety risk assessments.